>sleepy sunday today. the sky bodes for tea, naps, and curling up with a book. if i had a kitty, i would pet it. not too much going on except adhoc musings and… doing kitchener grafting over 110 stitches! for the first time! and being insane! it’s a luscious, cozy weight, stitched with knitpicks sierra and andean silk together on size 13 needles. the resultant mix of 35% wool, 11.5% merino, 42.5% superfine alpaca, 11% silk is supersoft, and i love the variegated effect of the heathered andean silk undulating throughout. however, i had to do some revisions because my gauge was about 11.5-12 sts, though the pattern gauge is 10 sts. the finished body is true to dimensions for the small (38″ is the small, so this is a very generous fit with ample ease), though i didn’t account for the increased number of stitches throughout. therefore, i’m in limbo right now because i need to order more yarn. i’m fretting that the dye lots of the ‘leaf’ color (in both yarns) will be terribly off. an even more alarming fact is that the ‘leaf’ sierra is out of stock at knitpicks… i hope they are not discontinuing it! however, i guess it’s not the end of the world if the hue of the sleeves are perceptibly different. at least each large section of the sweater shall be consistent. 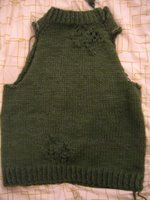 the same leaf motif (i <3 knitted leaves, woo) is conducted on the collar, near the bottom, and on the left sleeve. 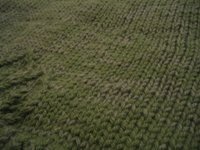 however, to make the leaves work, the top half is knit from the collar down, and the bottom is knit from the bottom edge up. then, with the patience and persistence of a goddess, you graft the pieces together. i wonder… is it impossible (or tricky) to knit leaves from the tip down, rather than from the base up? it's probably due to the fact that decreases are better than increases at being visible outlines (tapering the leaf to its tip). 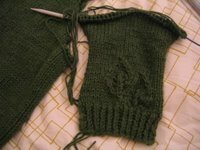 but still, grafting an entire sweater all around takes severe courage and attention to the tension and evenness of every stitch. otherwise, the graft sticks out like a sore, stitchified thumb. it was extra tricky in this case because (1) i had never tried kitchener before delving into the leaf sweater, not even with practice grafting swatches (call me foolish or ambitious), and (2) the double-stranding engenders the same stitch tension issues, times two, plus the complexity of twisting (oh, that annoying 3rd dimension). however, somehow i managed. :) here’s the proof! but, admittedly, i did physically screw up the kitchener technique twice in the process. both times, i know, was when i stopped to put it down for a bit, and then started back up again. as careless as i am, you have a 50% chance you’re beginning at the correct step. but, hey, no one can tell unless their nose is somewhere it shouldn’t. plus, i can always aver that ruching is back in style. i got some great generic, cuff-down, adaptable sock patterns from danielle and femiknit mafia last thursday, so i’m trying it out on this adorable fairisle-patterning sockotta in color 6670 from plymouth yarns italian collection. don’t adjust your monitor; those definitely are size 2 needles. (going from size 13 to size 2 takes a little adjustment, but i end up acclimating quickly. it’s akin to putting down your viola and picking up your violin. the movement is similar but the framework has changed. your mind and your fingers attempt to rectify the inconsistencies.) the gauge on the label reads 7 sts per inch. 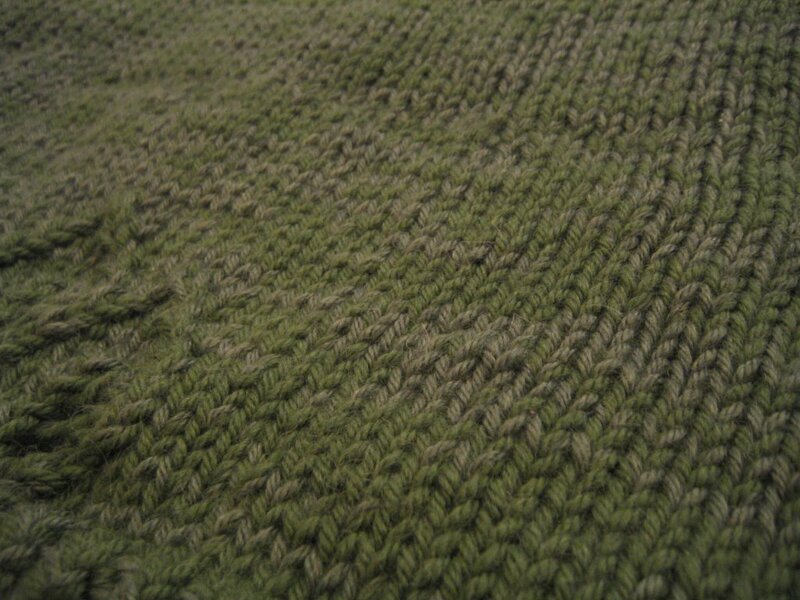 the tension i am producing on my needles is perfect, though i’m getting 9 sts per inch. heh heh heh. 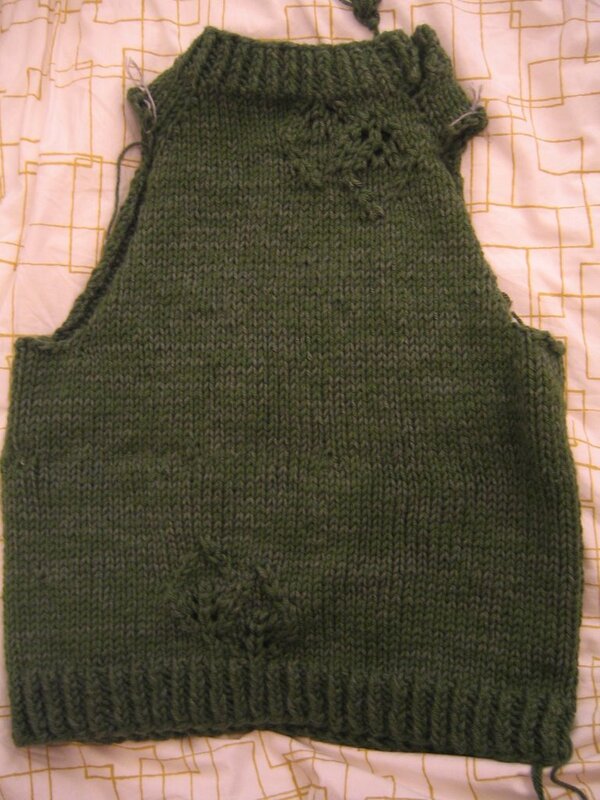 what… i’m not a tight knitter! i’m just efficient. my hands are like a data compression algorithm. >Nice job on the socks … you’ve accomplished a lot already! 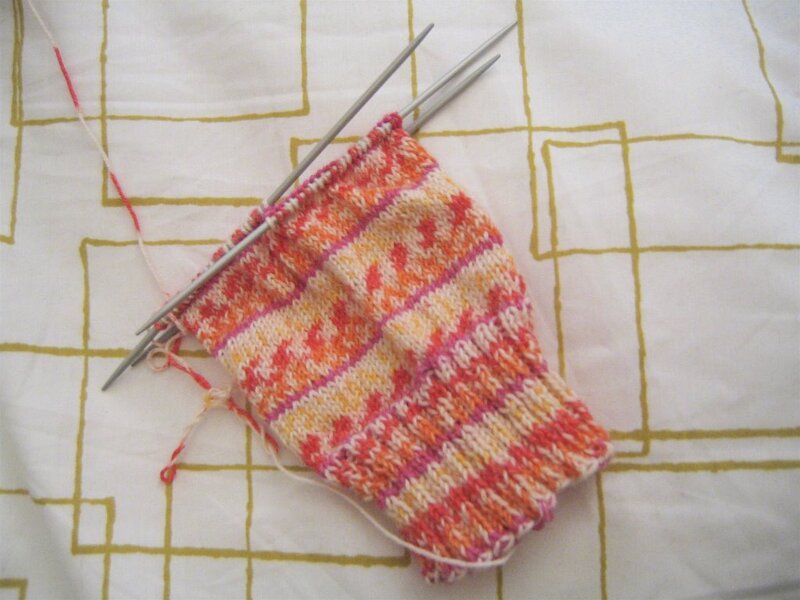 I almost always knit my socks at a tighter gauge than the yarn manufacturer recommends. My KPPPM socks were 8.5 sts/in, instead of 7, and my Red Sox socks were 7 sts/in instead of 6.5. I like the denser fabric better, and I think it will wear better too.